The movies, shows, and games that we share with our loved ones and our free time give us some of the finest everyday memories life has to offer. This beautifully refined TV Stand - featuring a beautifully tall hutch and a wide array of storage options perfect for housing any growing library of DVDs, games, and books - is the ideal home for all media needs, providing a sturdy and durable platform that has the versatility and good looks it needs to function as a perfect living room, guest room, or bedroom TV stand. Use the menus above to choose your ideal custom options for this piece. Every element of your entertainment center will be crafted by hand right here in the United States by dedicated woodworkers with decades of experience in woodworking, promising you nothing but the best in American quality and care. If you've any questions at all, please don't hesitate to give us a call or an email - we would love to do whatever we can to bring every detail of your perfect entertainment center to life! 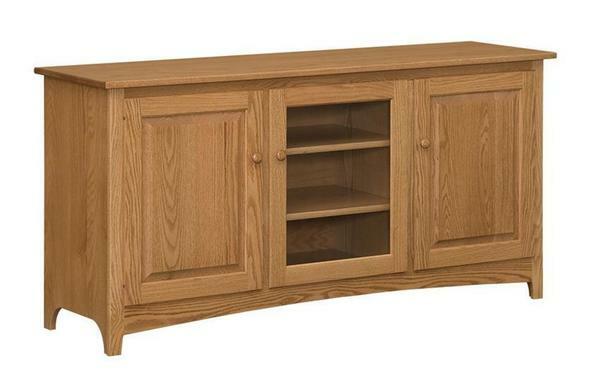 Height from Base to Hutch Top: 46"
Overall Width w/ Moulding: 67 1/2"